The New York edition of PAF will be an evening of several audio visual installations and performances, utilizing the architecture of Pioneer Works as a platform for site specific interactions. A group of more than ten international artists will participate in this “exhibition laboratory” exploring the interconnection of electronic music with the moving image through the process of live coding, light installations, and the amplification of a mechanical knitting machine. The installations in the space will continually evolve through images, sounds, and physical climbing interventions transforming the initial static layout of the exhibition to change and adapt throughout the program. PAF was established in 2000 and is a Czech platform for moving image, animation, and contemporary art. PAF organizes yearlong dramaturgical and production activities, curatorial exhibitions, projections, and workshops, and publishes books within its own Edition PAF. Its main output is PAF—Festival of Film Animation and Contemporary Art held annually in Olomouc, Czech Republic, and whose 15th edition takes place December 1-4, 2016. Participating artists: Alexander Campaz, Carpets Curtains (Filip Cenek & Ivan Palacký), Micah Hesse, Vojtěch Fröhlich, Jonathan Monaghan, Plain (Pjoni, Jan Šicko), Roj (Martin Blažíček, Jáchym Pešek, Kryštof Pešek, Alexandra Timpau), Yoshi Sodeoka, and Zuzana Žabková. Micah Hesse is based in New York City and graduated from The Cooper Union School of Art in 2013. Recent group exhibitions: On Item #8 at Agnes Maybach, Cologne; A Thousand Friends (Part 2), New Jörg, Vienna; The Kids Want Communism at Museum of Bat Yam (MoBY), Tel Aviv; Lobbyless at Neumeister Bar-Am, Berlin. Jonathan Monaghan creates sculptures, prints and animated video installations that push the boundaries between the real, the imagined, and the virtual. Drawn from such wide-ranging sources such as science fiction and baroque architecture, his work evokes collective fears, desires and anxieties. Yoshi Sodeoka is a multidisciplinary artist and musician from Yokohama, Japan, who’s lived in New York for more than two decades. Sodeoka’s neo-psychedelic work with video, GIFs and print simultaneously inhabits the world of fine art, music. Alexander Campaz is a product developer, artist and designer. With an eclectic background in the arts and design Alexander Campaz currently leads the product development lab of NYC Factory. The project Infinity+1/LUX explores the seminal work Occulta Philosophia by Heinirch Cornelius Agrippa. Vojtěch Fröhlich works in the media of photography, video, installation and live action. He puts his body and mind in difficult situations, frequently coping with the very architecture of the gallery space, literally as well as symbolically, and often doing outdoor activities such as climbing and parachuting. Zuzana Žabková born in Slovakia now based in Germany is an artist, dancer and choreographer working in the frame of performance, video and installation. She is a 2016 danceWEB scholar at ImPulsTanz in Vienna under the mentorship of Tino Sehgal. Carpets Curtains is a pure sonic/image situation characterized by a volatile atmosphere and broken rhythms. Collaboration between Ivan Palacký, a soundlover, and Filip Cenek, a visual artist. Ivan manipulates micro-samples of field recordings and builds them up, adding unstable sounds from various objects sampled on stage. 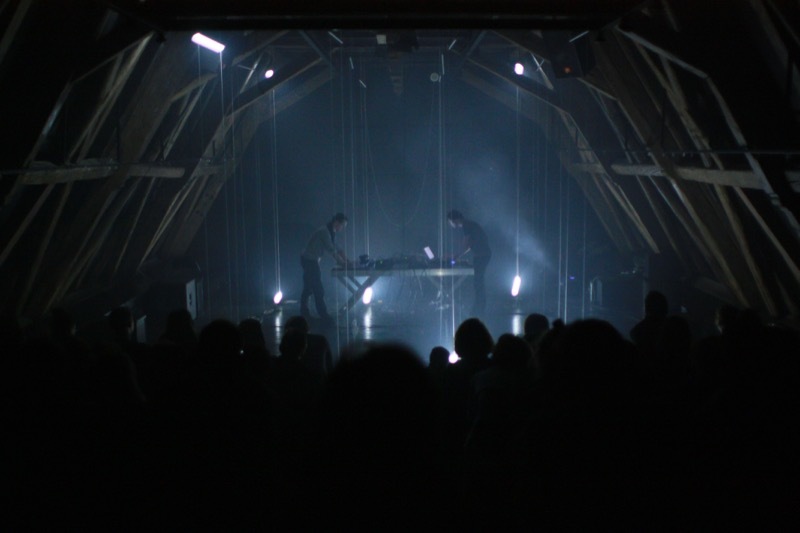 Plain is an electroacoustic spatial landscape created in real time by Jonatán Pastirčák and Ján Šicko. The viewer becomes a part of the scene, which can be actively perceived from different perspectives. The image is created by minimalistic and abstract elements. Roj‘s audiovisual performance is based on the group’s practice of using code in order to synthesize sound and image. The structure of the performance relies on improvisation, layering prepared definitions and autonomous visuals.